Day 3: April 29, 2015. Today we toured the Hippodrome, the Blue Mosque and the Grand Bazaar in Istanbul. The Sultan Ahmed Mosque, better known as the Blue Mosque, was built on the site of the Byzantine Emperors' Palace in 1616. 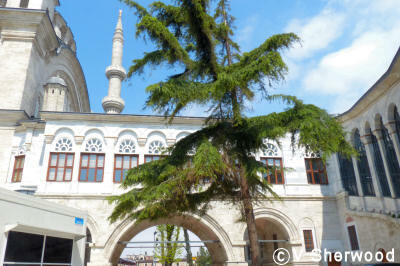 It was the first of 2 mosques in Turkey to have 6 minarets. 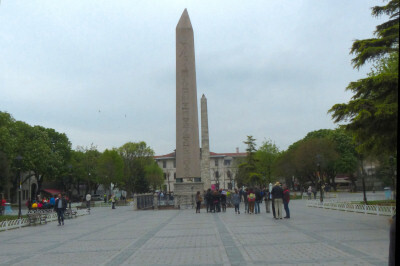 Beside the Blue Mosque is the Hippodrome which was built by the Roman Emperor Septimus Severus in 203AD and enlarged by Constantine when he moved the capitol from Rome to Byzantium. 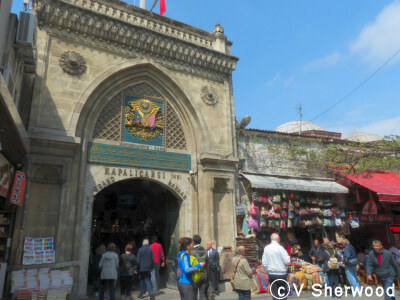 Started in 1455/56, the Grand Bazaar is one of the oldest covered markets in the world. It contains 61 covered streets and over 3000 shops. Over 90 million people visit it every year. At about 1 pm we boarded our ship, the Aegean Odyssey and set sail for Izmir. This is where the Hippodrome was located. There were seats for 100,000 spectators. All that is left today is 2 obelisks which decorated the spine in the centre of the racetrack. The 4 gilded copper horses which decorated the boxes at the northern end were stolen in the 4th Crusade in 1204 and taken to Venice where they can be seen in the museum in St. Mark's Basilica. The foremost obelisk was made for the pharoah Thutmose III around 1490BC and stood in the Temple of Karnak in Luxor, Egypt. It was brought to Constantinople in 390AD by Emperor Thodosius the Great. Only the top third remains. The obelist behind it is called the Walled Obelisk. It was originally covered with bronze plaques but there were pillaged in the 4th Crusade. 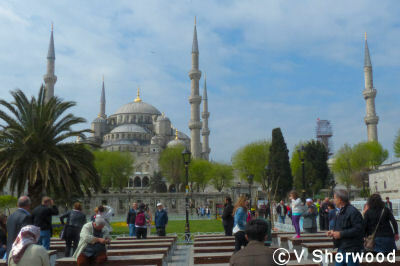 The Sultan Ahmed Mosque or Blue Mosque is built on the foundations of the Emperor's Palace, beside the Hippodrome. It is one of 2 churches is Turkey to have 6 minarets (the right rear one is being renovated). When it was built in 1616, many people were angry because it had as many minarets as the mosque of the Ka'aba in Mecca, so Sultan Ahmed had a 7th minaret built on the mosque in Mecca. The main entrance which is used by worshipers. Tourists enter around the corner to the right. 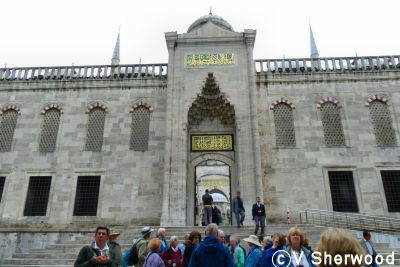 Part of the facade of the forecourt which is about as big as the mosque itself . 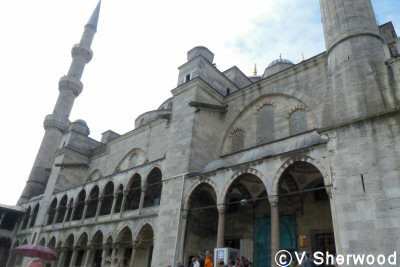 The mosque is called the Blue Mosque because of all the blue tiles used in the interior. 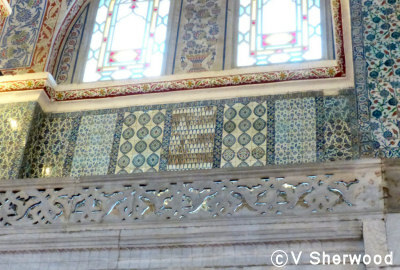 Over 20,000 handmade ceramic tiles from Iznik decorate the inner walls and domes. The central dome is about 23 metres in diameter. The dome of Hagia Sophia is 31 metres.The Blue Mosque has 8 secondary domes.. There are over 200 stained glass windows. The original glass was a gift from Venice but most has been replaced by modern glass. The stained glass windows do not let in enough natural light, so there are huge chandeliers to light the interior. The prayer area is carpeted with a beautiful red patterned carpet. 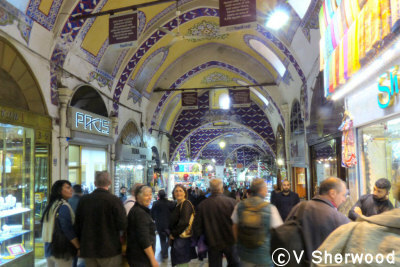 The Grand Bazaar is one of the oldest and largest covered markets in the world. It was started in 1455/56. soon after the Ottomans conquored Constantinople. It has 61 covered streets and over 3000 shops. This is looking down one of the covered streets, lined with shops on both sides. There are intersections with perpendicular streets. 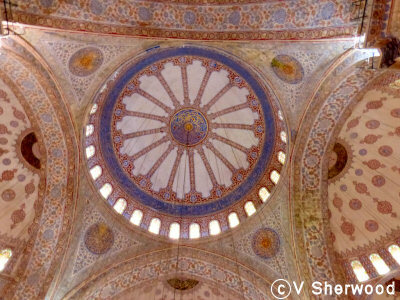 As in all Eastern buildings, look up - the ceilings are covered with beautiful mosaics. 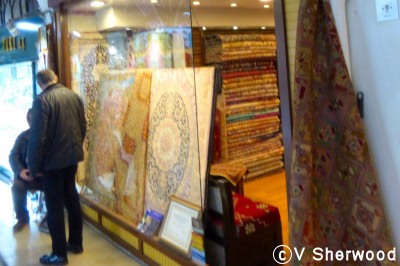 All the traditional wares are for sale, here Turkish and Persian carpets. The shopkeepers do not wait inside their shops for customers; they sit or stand outside, often calling out to passing people to come and look at the bargains inside. Everywhere you were expected to haggle to get a good price. 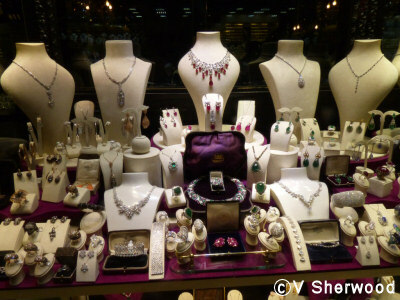 In the part of the bazaar that we saw there were many jewelry stores, some very expensive, others filled with cheap imitations. This was an expensive one but that does not guarantee that all the gems are genuine. One of the main products sold in Turkish shops and by street vendors is pashima scarves and stoles. Pashima is a mixture of cashmere and silk, soft and light as a feather. 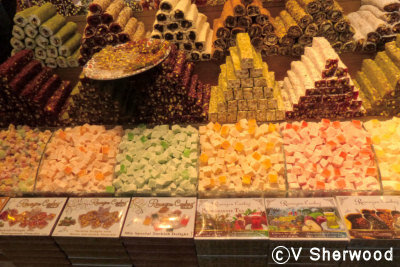 There were many shops selling spices and candies. 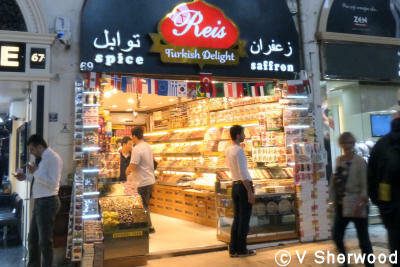 This shop specializes in Turkish delight candy, a traditional sweet in the Near East. We were very strong and did not buy any. 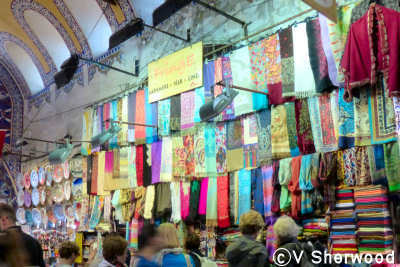 In fact, we did not buy anything in the Grand Bazaar as we did not have any Turkish lira. We waited until we were in Greece and could use euros. 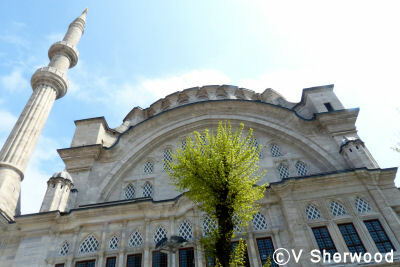 Beside the Grand Bazaar is the Nuruosmaniye Mosque, which was started by Sultan Osman !!! in 1748. 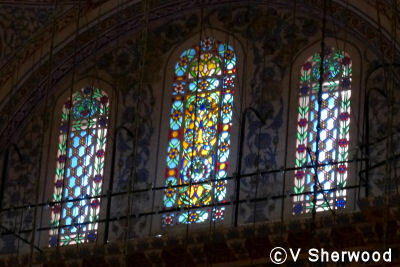 Nuruosmaniye means Light of Osman and was named that because of its many windows letting natural light into the mosque. 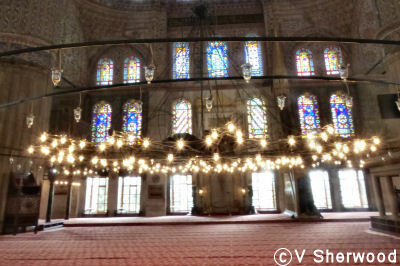 The Nuruosmaniye Mosque complex includes a school and a library which contains 7,600 books and manuscripts.